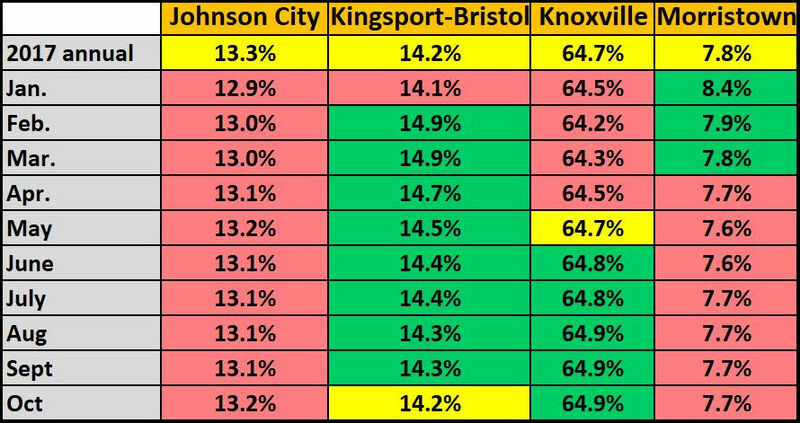 Kingsport-Bristol’s November sales tax collections were the best in the state when compared to October, but the lowest in the state when the focus shifts to November last year. It was also the first month this year when the four-county metro area’s share of total collections in NE Tennessee dropped below its 2017 benchmark. Year-to-date sales tax collections performance of NE Tenn. metro areas. Statewide collections were up 9.1% from last year, according to the MTSU Department of Economics and Finance and the state Advisory Commission on Intergovernmental Relations. Knoxville’s Metropolitan Statistical Area (MSA) was the only metro area in NE Tenn. with collections above the state level. 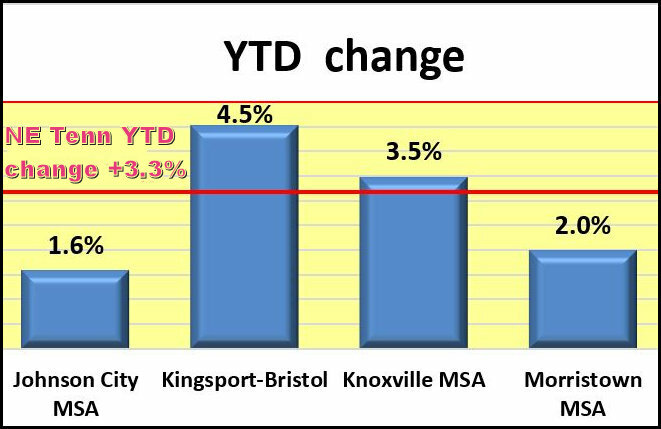 November’s year-over-year collections were the second straight decline for Kingsport-Bristol and the second straight monthly gain for the three-county Johnson City MSA. Year-to-date market share of sales tax collections in NE Tenn. metro areas. Here how collections looked compared to October. So far this year Kingsport-Bristol and Knoxville are the only metro areas with year-to-date collections that exceed the region’s performance. Nationwide consumer spending was up for the ninth straight monthly gain as the main driver of the economy maintained its momentum into the last month of the year. Seasonally adjusted personal consumption increased 0.4% from November last year putting outlays on pace for the best quarter of growth in four years. Reports on personal income were also up in November, but at only half the rate of consumption. According to Wall Street Journal reports, strong spending and modest savings suggest consumers were confident in the middle of the holiday shopping season. Household spending accounts for about two-thirds of the nation’s economic output has been supported so far this year by rising incomes and low unemployment. Although government spending, despite the shutdown, should remain a positive force unless market turmoil causes consumers to cut back on spending.